How do you know when your child is ready to drop a nap? It’s a common question, and there is no easy answer. Here’s a quick recap of my experience with naps with my 2 kids. Months 0-6 – during these early months, my children napped whenever they were tired. They nursed and slept “on demand’. I generally nursed them to sleep either on a bed (if we were home) or in a carrier if we were on the go. I kept an eye out for signs of sleepiness and always tried to nurse when they seemed sleepy, and if they were tired, they would usually fall asleep easily when nursing. If they seemed tired but didn’t fall asleep nursing, I would hold them and bounce on a yoga ball (if at home) or bounce in a carrier if out, and they’d usually pass out within minutes! Months 6-9 – with both kids, a fairly predictable nap pattern began to emerge. They napped three times a day – usually 2-3 hours after waking either in the morning, or from a previous nap. The last nap was usually a cat nap around dinner time. 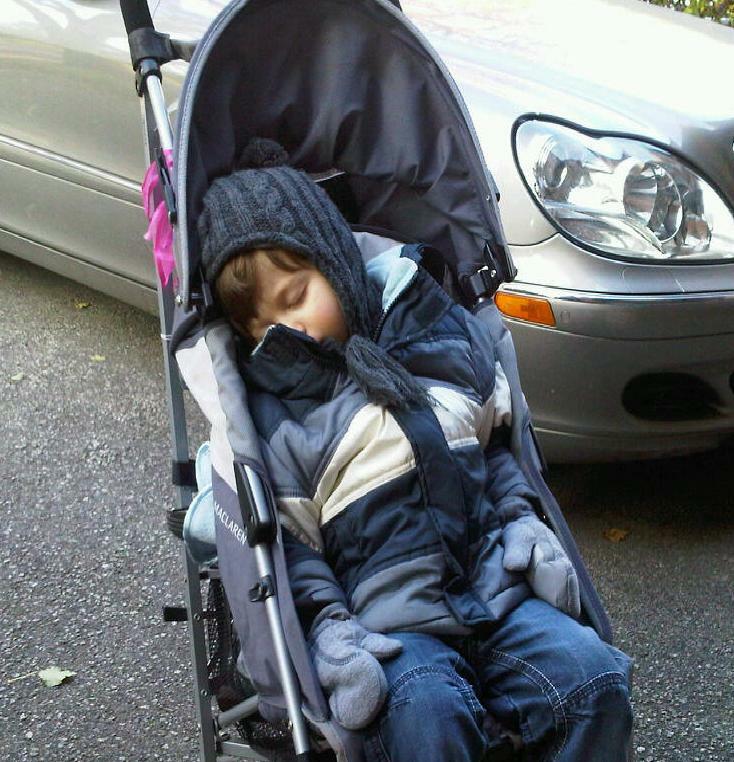 During this stage, naps were mostly at home and sometimes on the go in a carrier or the stroller if we were out and about. Kids were nursed to sleep. Months 9-12 (or a bit longer) – at this point, both kids napped twice a day – usually once around 9 am and then again around 2 pm. I still followed sleepy cues and would nap them a bit earlier or a bit later if necessary. At this point, naps were almost always at home, and kids were nursed to sleep. Months 12 – approx 2.5 years – naps dropped down to once a day, at around 12pm. At this point, naps were almost exclusively at home, as I found they slept better in the quiet of our house, and I used the downtime to do things around the house. Kids were nursed to sleep. It’s always hard to know when a child is ready to drop a nap. I found that there were two predictable signs – either the child wouldn’t nurse to sleep easily at naptime, or bedtime was getting really late. When I noticed these signs, I would try to drop a nap and observe what happened. There are also signs that a child is not ready for dropping a nap. If you’ve tried dropping a nap, and the child is falling asleep at an old nap time either in the car or the stroller, or the child is super cranky around dinner time, it is possible that he or she was not ready to drop a nap, in which case I’d recommend reverting to the previous nap schedule. Also, it doesn’t have to be “all or nothing”. Some kids benefit from a transition period – where they nap some days, and then don’t nap other days. This can be hard as you really have to pay attention to your child’s sleeping cues, and you have to be really flexible with your schedule and be ready to nap your child when they need to sleep! I should add that I personally have never been a big fan of carseat naps – I prefer my kids to nap at home so I can either get things done around the house, or nap with them!! I’ve mentioned before that nursing to sleep has always been a wonderful experience for us. I know it goes against all the advice that traditional “sleep experts” espouse. I stopped listening to those experts a long time ago, and I’ve never looked back! How have you been able to tell that your child needs to drop a nap? Do you have a nap time routine? Categories: Breastfeeding, Sleep | Tags: Breastfeeding, Naps, Sleeping, toddlers | Permalink. This post is part of the Carnival of Breastfeeding on the topic of “Extended Breastfeeding” hosted by Blacktating and The Motherwear Breastfeeding Blog. See below for links to the other participants’ posts. Benjamin was born approximately 3.5 months ago, and I’ve been tandem nursing ever since. What is tandem nursing you ask? Tandem nursing is the term used for breastfeeding siblings concurrently. Tandem nursing has been practiced by moms around the world for centuries. It happens when a nursing toddlers does not wean when his or her mother is pregnant. The toddler nurses throughout the pregnancy and continues nursing when the new baby is born. This is what happened in our case. Never did I imagine that when I started nursing Dylan over 3 years ago that I would be tandeming…but here I am! I’ve tried to be as honest as possible about my experience, and hope that I can help other moms who are tandeming or considering it! There have been a number of benefits to tandem nursing. First, with both Benjamin and Dylan nursing, my milk came in really quickly after Benjamin was born. Within 48 hours after birth, my milk was in. This was wonderful! So many moms have a rough time nursing before their milk comes in, as the baby can be very fussy, won’t sleep and often wants to nurse around the clock. This of course is normal – the baby needs to nurse extremely frequently to stimulate the milk to come in, but can be tough on moms who are exhausted from birth. By having my milk come in quickly, I avoided those issues – Benjamin wasn’t fussy, gained weight quickly and slept well, right from the get-go! Tandem nursing also helped with engorgement! My milk supply was plentiful when it came in. Whenever I was feeling a bit engorged, I would ask Dylan to nurse and the problem was solved. This was particularly helpful at night when Benjamin started sleeping longer stretches. Sometimes I would wake up uncomfortably full and in pain and I’d latch Dylan on in his sleep (even though he had nightweaned during my pregnancy)! Much easier than trying to hand express or hook up a pump in the middle of the night. Tandem nursing also helped Dylan adjust to all the changes in our lives. It was comforting and reassuring for him to know that he could still have “mommy milk” after Benjamin was born. Nursing Dylan during the early postpartum days was an easy way for me to give him attention – I could do it lying in bed, and it often led to a nap for him, which was a great way for him to get a bit more rest when our routines and schedules had been turned upside down! I’m not going to lie. Not everything about tandem nursing is sunshine and roses. Firstly, it’s difficult to deal with all the doubters. My family basically thinks I’m crazy to still be nursing a three year old. I don’t blame them – while nursing past the age of one is common around the world, it is not common where we live. I’ve also been battling with oversupply, and I believe that it has been made worse by tandem nursing. When Benjamin was around 6 wks old, I finally clued into my oversupply problems. He would often choke on my milk during a feed. It would dribble down his face and spray everywhere if he popped off during a feed. He was extremely gassy and spit up like crazy. He’d often be cranky and cry after a feeding, and he would rarely comfort nurse. So while it was wonderful in many ways to have an abundant supply thanks to the extra stimulation my body was getting from a nursing toddler, my oversupply was negatively affecting Benjamin. After recognizing that I had oversupply, we changed our nursing patterns and now my supply is mostly under control. In the last few weeks I’ve felt DONE with nursing Dylan. This saddens me because up until recently I’ve really loved our nursing relationship. I am passionate about extended nursing and strongly believe in all of its benefits! I believe(d) in child-led weaning and wanted to wean only when Dylan was ready. A wonderful resource for tandeming moms is Hilary Flower’s book Adventures in Tandem Nursing. I read it while pregnant, and recently started flipping through it again while trying to figure out how to deal with my new desire to wean Dylan. I read this list and felt like it was written just for me! Dylan and I have always been so close, and lately I feel myself withdrawing from him. He just seems so BIG when he nurses, and nursing him is grating on my nerves. It is funny really, because I could nurse Benjamin all day and not be annoyed, but when Dylan nurses for even a couple of minutes I’m beyond irritated and start pushing him off and often snap at him, as listed above! I call this the “ugly” because I feel like I can’t really complain about tandem nursing, because I created this problem since I chose to nurse Dylan this long. It is also very conflicting for me because I so strongly believe in extended nursing and in weaning when a child is ready. However, I have to honor my own feelings towards nursing and I’m allowed to want to wean Dylan. Hilary Flowers says “sometimes a ‘loving, gentle weaning’ describes the space the mother is holding, and leaves room for the child to go through a range of feelings and reactions”. I take this to mean that while Dylan may be upset as I wean him and put limits on his nursing and say no, it is still possible for this to be loving and gentle, because that is my intention. Wish me luck…I will keep you posted on what happens! 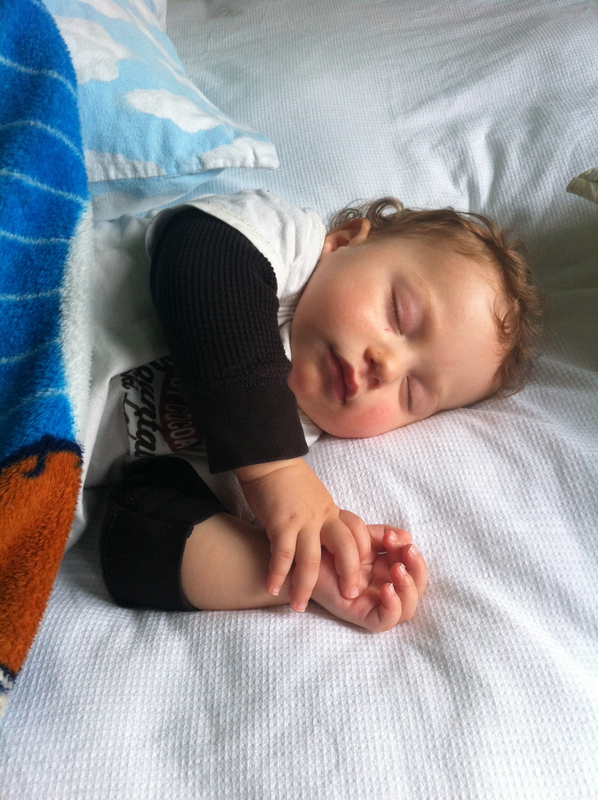 Since I wrote this post on April 11th, we have cut down on Dylan’s nursing sessions. He was nursing when he woke up in the morning, sometimes in the afternoon, and always before bed. We’ve cut out all nursing sessions except the one before bed. It has not been traumatic at all – there was a bit of complaining on the first few days but he seems used to it now. I’ve decided to keep the before bed one because it really is such an easy way to get him to sleep easily and peacefully. I’m quite happy with this arrangement. I’ve realized that I don’t need to fully wean Dylan right now…setting limits has really made a big difference in my mood! Mamapoeki from Authentic Parenting: Extended Breastfeeding? Categories: Breastfeeding, Pregnancy | Tags: Breastfeeding, toddlers | Permalink. Sometimes all a pregnant mamma needs is to go for a walk outside on a cool fall’s day and have her toddler peacefully drift off for a well-needed nap. Pure heaven. Categories: Pregnancy, Sleep | Tags: Sleeping, toddlers | Permalink. 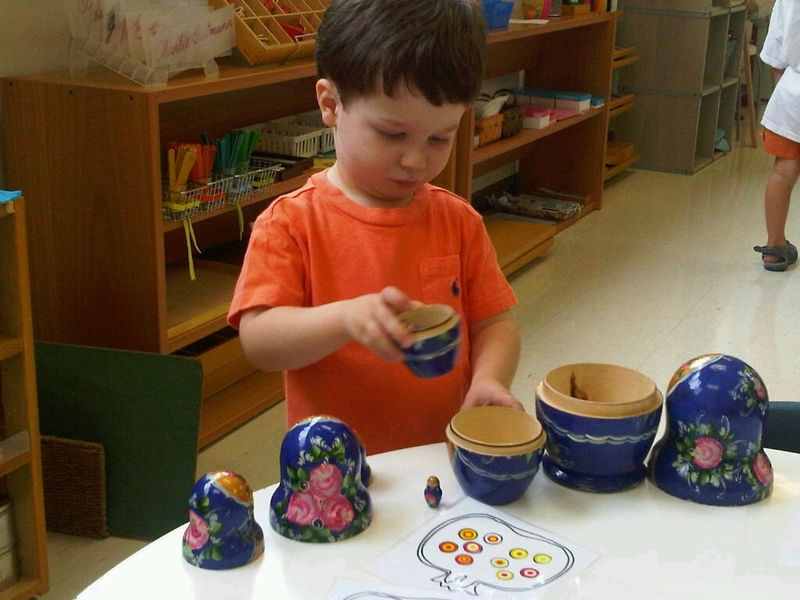 As mentioned in a previous post, Dylan started a Montessori school in September. There are a lot of different things that drew us to this school in particular and to a Montessori school in general. One factor that drew us to a Montessori school was learning more about Sensitive periods – a term coined by the Dutch geneticist Hugo de Vries and adopted by the founder of the Montessori system, Maria Montessori. Maria Montessori belived that children experience leaps in learning from birth to age 6, during sensitive periods. These leaps can be thought of as periods of time where children easily acquire certain abilities, such as language. It is possible learn a new language, for example, later on in life, but this requires more effort. Sensitivity to Language – from birth to age 6, children are extremely sensitive to vocal sounds and acquire language skills rapidly. Sensitivity to Order – from approximately age 1 to age 3, order is extremely important to children as their brains are organizing a mental scheme of the world surrounding them. Often, what is thought of as an outburst or tantrum is simply a child reacting to apparent disorder that they observe. Sensitivity to Movement – from the age of 2 to 4, a child posseses a sensitivity to movement. In order to learn, they must move about their environment. This is why it seems like a toddler or preschooler can’t sit still – it often appears as if they are in contant motion from the moment they wake until the moment they go to sleep! Sensitivity to Small Objects – children between the ages of 1 and 3 have a strong interest in small objects. For example – a child might notice and be fascinated by an ant crawling on the ground where an adult would not even notice it. Sensitivity to Sensory Impressions – children learn about the world around them by exploring their environment with their senses – they touch, smell, taste, feel and hear things as they explore the world. We were impressed how Dylan’s school respects the sensitivities that toddlers and preschools experience and sets up the classroom and the daily routine in a manner that allows these sensitivities to be explored. We are learning more and more about the Montessori philosophy each day. Next week we will be going to a curriculum night at Dylan’s school and I hope to share more Montessori information with you! Categories: Uncategorized | Tags: toddler activities, toddlers | Permalink. Dylan started a new school yesterday. It is a Montessori school and he is there a couple times a week for half days and a few times a week for whole days. On the whole days he needs to bring his lunch with him. This is new to us – when he was at daycare lunch was provided to him. A few weeks ago I began my search for the perfect containers and lunch bag for him. They had to be easy for him to manipulate and open and I wanted to avoid plastic where possible. After quite a bit of research, I decided on buying LunchBots stainless steel containers for his food, and a Fluf organic cotton lunch bag. We already had a Kleen Kanteen sippy cup for his drink, which we use also. I put a sandwich in the LunchBots Uno Stainless Steel container. So far I’ve made a sandwich on organic whole grain bread with hummus, cut up into quarters, and also another sandwich on the same bread with cream cheese. 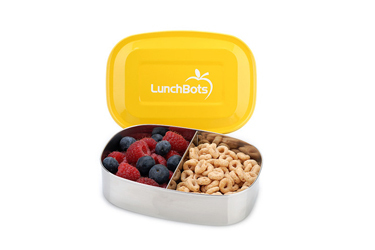 I then use the LunchBots Pico container for snacks. It has a handy divider in the middle – I put cut up fruit on one side and cut up veggies on the other. Dylan has enjoyed apples, plums, carrots, cucumbers and and celery. Nothing too exciting – but simple and healthy nonetheless! 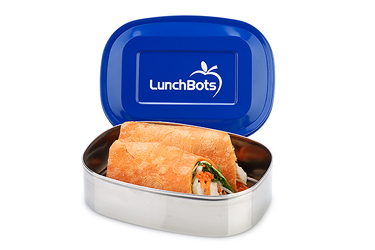 I chose the LunchBot containers because they are easy to open and because they are stainless steel, rather than plastic. Both the container and the lid are made from 18/8 stainless steel. The top of the lid is powder coated with a non-VOC finish. It is certfied lead free and is dishwasher safe. It is best suited for solid food (like sandwiches or cut up fruit), not for liquids like soup or yogurt. 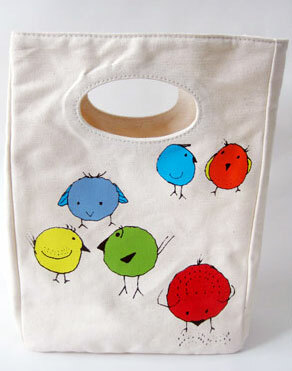 I liked the Fluf lunch bag because it is made from machine washable organic cotton. The bags have fun designs printed with water based inks and the handle is easy for Dylan to carry. It has a removable non-PVC EVA lining (free of toxins, BPA and phthalates) that can be rinsed out and handwashed. The lining holds the LunchBot containers perfectly in the middle and creates pockets around the outside. I put Dylan’s Kleen Kanteen in one pocket, a cloth napkin in another, a cloth placemat in yet another, and in the last pocket I put a small ice pack. While the bag is not techinically insulated, I find that his lunch remains cold for the entire day with the ice pack. So far I am quite pleased with the products I have purchased! I am liking them so much that I am considering buying some for myself. Why should I be stuck using our old plastic Ziploc containers? Note: These products were not provided to me free of charge. I paid in full for these items. I have no financial interest in them – I just find them to be useful! 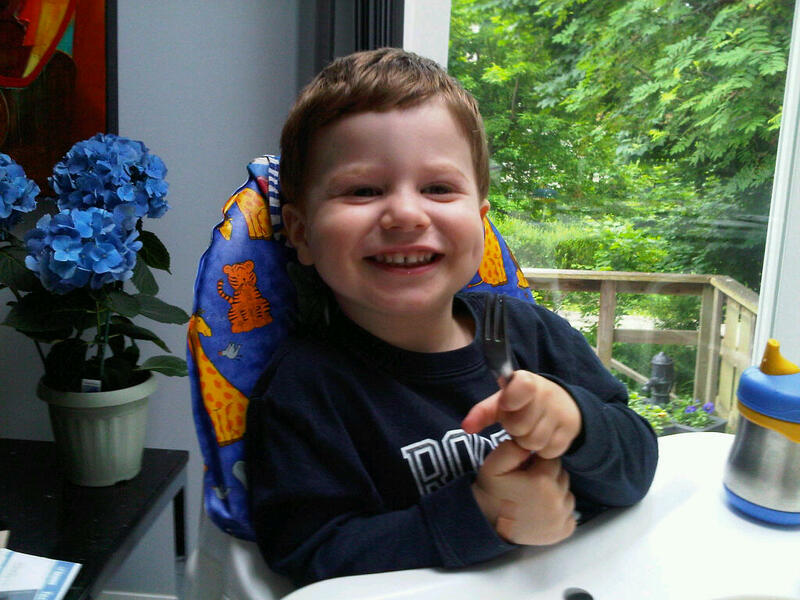 Categories: Food | Tags: Food, toddlers | Permalink. Nursing Covers – a help or a hinderance? Before Dylan was born, I made lots of lists of things that I would need for a new baby. I had heard about the Hooter Hider nursing cover from a friend and thought it was ingenious! I had to have one! It was on the top of my baby must-haves. It did come in handy as I wasn’t a confident nurser during the first few weeks. I felt like I had to take off most of my clothes just to get Dylan latched. I couldn’t figure out how to nurse “discretely” so the nursing cover helped a lot. The rigid wire across the top allowed me to see in but kept me completely covered. I made sure it was always in the diaper bag when we went out. I used it when we were at restaurants or the mall, or when I was in front of male family members or friends. Dylan nursed A LOT in the early months and unless I wanted to stay home all the time (which I didn’t) I had no choice but to nurse in public! As Dylan got older, I became less reliant on the cover. I discovered that I could wear a nursing tank with a t-shirt on top and when I nursed Dylan’s head covered anything that needed covering. Also, as Dylan got older, he disliked being under that cover! He’d play with it and kick at it and grab it and basically the cover became a nuisance. As time passed, I became more confident about nursing and our nursing relationship. I joined La Leche League and was exposed to lots of other moms nursing their young babies, older babies and toddlers in public. I began to nurse Dylan anywhere and everywhere without the cover – in the park, walking down the street in my Ergo, waiting at the pediatrician’s office, on the beach, at the pool, on the plane…in fact now I can’t think of a place where I didn’t nurse Dylan! As I gained nursing experience, my views on my nursing cover changed. No one would ever bottle feed covering their baby! No one would ever feel the need to hug or kiss their baby behind a cover. Nursing is basically feeding and nurturing together in one – and neither of those actions needs to be done behind a cover. So why should nursing be done behind a cover? With baby #2 on the way, I have given my nursing cover a lot of thought. I now see myself as a breastfeeding advocate, and I want to help normalize breastfeeding in society. I believe that one way of doing so is to feed my baby anytime anywhere without a cover. Now that I have more confidence and more knowledge I want to nurse my next baby in public without my trusty Hooter Hider right from the start. Will it be a bit awkward to feed my new baby in front of my father in law without a cover? Will it feel weird to sit on a bench in the mall and nurse without a cover? I’m sure it will, but if I can give one mom an extra bit confidence so that she feeds her baby in public instead of in a bathroom, and if I can show one more person that breastfeeding is normal, then it will be worth it! I should add that I have nothing against nursing covers or moms that use them. In fact, they give some moms the confidence they need to nurse in public – and I completely respect and understand that! I should also add that I still nurse my 2.5 year old son Dylan but not in public anymore. I feel somewhat hypocritical about that, especially as a La Leche League leader! While I feel ready to nurse a baby in public without a cover, I don’t feel ready to nurse my older toddler in public. I’m not completely sure about my reasons behind that…I must give them more thought and explore them in a future post! Categories: Breastfeeding | Tags: Breastfeeding, toddlers | Permalink. Today Dylan and I had lunch at my mom’s house with one of my mom’s cousins, S. We were eating bagels, cream cheese and smoked salmon. Dylan, the little foodie that he is, requested some capers from my mom. S was amazed that Dylan liked capers. She asked him what capers taste like, and he said: Mommy’s Milk! S said that they must taste very yummy if they taste like mommy’s milk. Dylan agreed! S then asked me how long I nursed Dylan and I told her that I still do. She said that she nursed her daughters (who are now in their 20s) til they were 18 months old. That is pretty impressive considering at the time many moms didn’t breastfeed at all and formula was the norm! Dylan and S really hit it off at lunch. He sang songs and told stories and jokes. He smiled a lot, laughed a lot and just oozed sweetness! Before S left, she told me that she had a wonderful time with us, and that Dylan is an advertisement of why moms should nurse for a long time. It was such a lovely compliment, and it truly made my heart happy! I felt so proud! Categories: Breastfeeding | Tags: Breastfeeding, Food, toddlers | Permalink.